traffic design | Why you drive bad?! Every time I drive north on MoPac I pass this unmarked exit just south of US183. The exit only puts traffic on the frontage road, but the frontage road doesn’t intersect any other road until it passes US183 and gets to Loop 360. 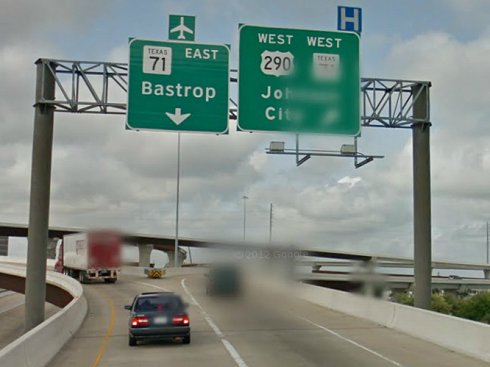 Both US183 and Loop 360 have dedicated marked exits so I’m not sure what this exit is for. The exit lane from MoPac becomes the left-most lane on the frontage road, which then becomes an on-ramp for US183 (for northbound traffic coming from Steck Avenue/Anderson Lane/Spicewood Springs Drive). Once on the on-ramp and flyover, the two left lanes are for US183 northbound and a single right lane (the on-ramp lane) becomes the US183 southbound exit lane. 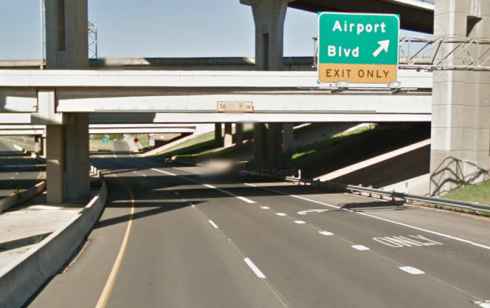 I believe it would be in good intentions if this unmarked exit was marked as the US183 southbound exit from MoPac since it pretty much puts traffic into the US183 southbound exit lane on the flyover anyways. That way there isn’t a giant kerfuffle at the actual US183 exit (people just don’t understand how to maintain their speeds at that point). Downtown Austin has the shortest on-ramps. The on-ramps on I-35 through downtown Austin are relics of a time past when interstate travel was sparse and leisurely. Today, it’s a total fustercluck. The short on and off ramps are antiquated with so much traffic. Even with sparse traffic you just hope some inattentive moron isn’t going to block you from getting on the highway. 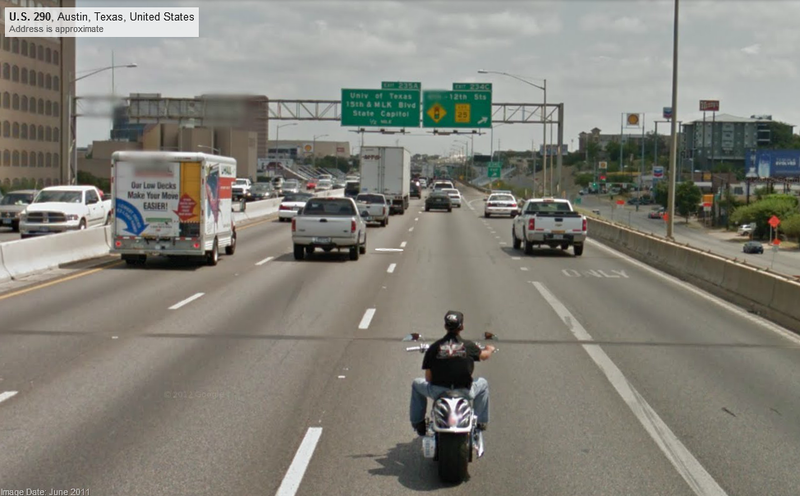 The above view is another shot from Google Street View showing the on-ramp at Cesar Chavez. Google Street View usually have a wide angle which makes things look farther away than they actually are. The on-ramp lane in the image shows it being really short. If it looks short in an image that’s suppose to make it look longer, then it must be short in real-life! It’s so short that if you go up to highway speed, you need to get off the damn freeway immediately! And if someone doesn’t move over for you, then you’re getting off the highway and getting back on again at the next on-ramp (after a couple traffic lights). You could be one of those entitled weenies who just stop on the on-ramp and wait it out. At that point I hope some truck passes you while on the upper deck and the wake causes your stupid car to fly off. No, I’m not bitter at all. There has been plans of burying I-35 through downtown and having a wide boulevard run on top of it with just one set of on and off ramps at both ends of the zone. What would be cheaper is to just build these endzone on and off ramps with a long lead and close off all the exits between Cesar Chavez and MLK. Six access ramps within a mile is overkill. It would totally be a lot cheaper to accomplish these end-zone access ramps as well. But what do I know, I’m not a civil engineer. You are not trying to destroy the death star. You should not be driving through the toll booth at 60 MPH. I hope this happens so I can laugh at you. I’m so glad you’re approaching from behind and swerved around me to the next open lane so you’re not gonna ruin my morning commute. 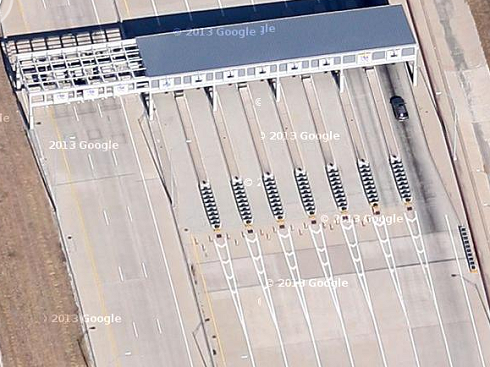 As you can see below, the traffic lanes become narrower at the toll plaza with large beefy guardrails in place. The toll plaza was designed to slow down and stop traffic because they were designed to accept exact change, but TxDOT converted all cash toll plazas to TxTag lanes without removing the guardrails. A standard traffic lane is 12 feet wide. The narrowed lanes are probably 9 or 10 feet wide. A standard sedan is about 6 feet wide. Yeah, it’s close. Good going guys. As long as I’m complaining about the toll booths, this isn’t fkn Wal-Mart! Open up ALL the lanes instead of that one lane. It’s not like an attendant is needed anymore since you aren’t accepting cash. Put some tag and plate readers and roll in the dough y’all! I’m rarely on I-35 and even rarer needed to go on eastbound TX71 from I-35. 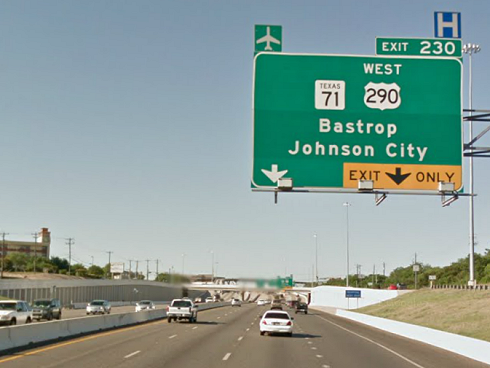 The other day I needed to go the airport from downtown and knew I needed to take eastbound TX71 there, so I’m on the lookout for the off-ramp. If you’re not already familiar with the roads in Austin, you’re gonna have a bad time. 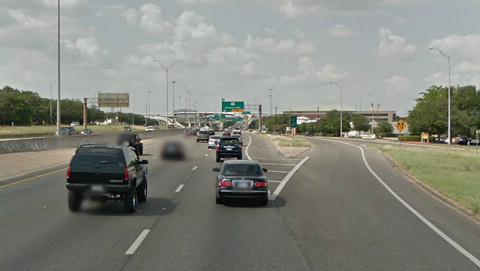 Here I encounter the junction of I-35 and TX71. 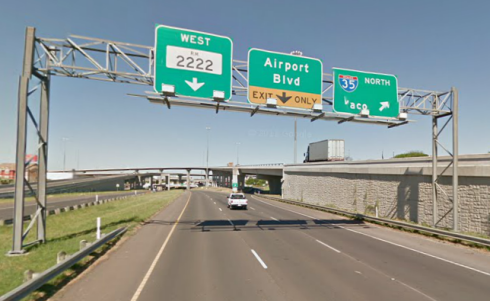 It could be a dedicated fly-over or it could put you on the frontage road or there just isn’t an exit. You never know unless you’ve driven here before. Well, the signs only indicate a westbound route. This leaves you thinking if there’s another exit or no exit for eastbound. 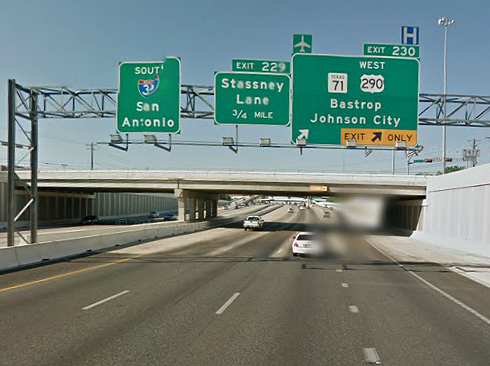 Getting closer, there is no sign indicating there is an eastbound TX71 exit. Knowing very well that I needed to go to the airport, I took my chances with the westbound exit because of the airport sign. Lo-and-behold there’s the sign indicating the exit for eastbound TX71! Why oh why wasn’t this marked earlier? !